Noble’s not alone in its claims. Here’s what the American Wind Energy Association (a consortium of wind developers) says about turbine noise. Today, an operating wind farm at a distance of 750 to 1,000 feet is no noisier than a kitchen refrigerator or a moderately quiet room…. The best test is to simply experience the noise from a turbine for yourself. You will find that you can stand directly beneath a turbine and have a normal conversation without raising your voice…. In general, wind plants are not noisy, and wind is a good neighbor. Wind turbine noise, old chap? 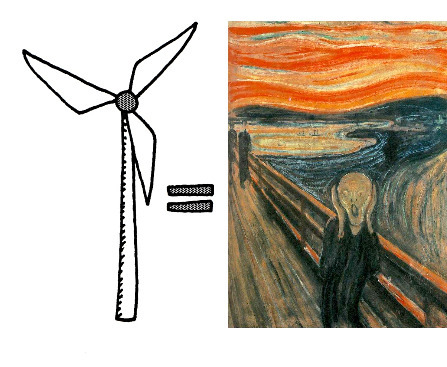 Merely “the rustling of trees.” BWEA calls its poetry, Noise from Wind Turbines: The Facts. Compare the wind developers’ facts with these facts, written by a realtor living in Shelburne, Ontario (Canada). Barbara Ashbee, by name. While the rest of us were celebrating New Year’s eve, Barbara was sitting before her computer composing the following letter to the Ontario Minister of the Environment, the Honorable John Gerretsen. Before reading the letter, first a little background on Barbara’s living situation. We live in the country in a raised bungalow on 1 acre, and are very happy with our lives. I am a realtor, with a background in building supply sales, and Dennis (my husband) and his brother own a swimming pool and spa business covering all aspects of the business from their retail store, to installations and maintenance. We are pretty happy and not really stressed about anything. We now have 11 turbines in easy view. The closest is 457 meters (1500 feet) behind our house, and another 700 metres (2300 feet) in front of our house. And there are some to the north and south. Our house faces east, and our backyard, west. Our kitchen and master bedroom are on the back (west) side of the house. They started testing them a few at a time at the end of November, early December 2008. Once they started up full time the problems started. Now the letter, dated December 31, 2008. 135 St Clair Ave W.
I am writing this letter to urge you to put a hold on these wind farms until your ministry does a lot more investigating. I am hearing people in the industry say that there are no ill health effects and minimal noise is emitted. Well, come to my house Mr. Gerretsen. Stay here for at least a week, so you can experience the full array of noise and vibration level we have to live with. This sound changes with wind speed, blade direction and atmosphere, ranging from a constant irritating low hum/vibration, to a never-ceasing jet flying overhead, to sounding like the house has literally been dumped into a running washing machine. Try to function with minimal sleep, so disturbed you find you are working in a mental fog. The windows are closed up tight this winter. Yes, this is winter, and yet we can hear the noise inside. Would you be able to entertain your guests or have a family barbecue on your back deck in the summer, with a tower of whooshing, gyrating noise just 450 or so meters behind you, sir? Maybe you could get used to the ringing in the ears that my husband now has to deal with. Please don’t suggest we move. Who is going to buy my house, standing in the middle of a wind farm with noises so loud you won’t be able to sleep at night? If the wind comes from the east, not the west, then there is the one in the front to “soothe” you to sleep at night. Would you buy my house, sir? I don’t think so. There are laws in place to protect the buyer, sir, where we would have to disclose any deficiencies regarding our property. This noise would definitely count and it is the right thing to do to let people know what they are getting into. It is called, being ethical. Where was the disclosure from the company who put these turbines in so close to me? Why are there different laws for them? This government is allowing something to take hold of the entire province without full knowledge of the effects on people, and is letting these wind corporations run … through this province like madmen. Let me give you my own personal view of what seems to be going on with this process. Landowners/farmers are approached by energy corporations with offers of annual sums of money that may be very hard for a landowner/farmer to resist, and they tell them that this province needs green energy and what a wonderful contribution they are making, and they get them signed up. They do not knock on the door of the neighbouring non-participant landowner and give them the information that they need to decide if they can continue to live there. These homeowners really don’t matter and they certainly don’t want or need them slowing the process. They send a letter, and maybe a flyer. No need to register it. If it gets lost, well, what can you do? So, Mr. Farmer in the middle of the project doesn’t want to participate? Maybe they tell them how all of their wonderful neighbors have been signed up to host windmills, and that if they don’t they will be surrounded by them anyway, so why miss out on the income everyone else is getting? But they need to make a decision before it’s too late. Then make sure they get that amendment to the official plan to allow renewable energy/windmills, and reassure the township that they too will be receiving a generous sum of money annually that they can put to good use. How am I doing so far? Well, looks like everything is in order now…let’s have a meeting. It doesn’t really matter what concerns or rights anyone has to their property; they will get talked around and maybe even a good old blank stare when answering. What’s that? Those turbine sites seem too close to you? Well, we’re sorry but it is all compliant with the Ministry of the Environment (MOE), so please don’t worry about it. If it’s been approved by your government, then they know what’s good for you. And so they continue and they are erected. And my husband and I do our best to embrace the intention of the windmills, and watch with wonder as roads are built and huge trucks with police escorts deliver these wonderful pieces of environmental art. And then I look out my back window and I look out my front window and look how close they are and think, “Wow…they are really close. I hope they aren’t too loud.” Perhaps I can put up with the drastic change to my view all around me for the sake of green energy. I want to help the country and the environment too. We’re sorry they’re keeping you awake, we are told, but we can assure you we are compliant with the MOE, and they say this noise level is fine. Well, thank you for your insight, but knowing this doesn’t help us get to sleep. And so they decide to do a noise study. Can we put you up at the nearest hotel so you can get some rest, we are asked? Thanks but no thanks. We are not willing to leave our pets and it is Christmas. Well, all we can do is offer. Can you please shut down [the] one closest to us at night so we can at least get some sleep? Sorry, it is not within my authority to do that, we’re told. How about that noise study? Let’s get some measurements taken. Gee, about half of the windmills were shut down when the attended readings were taken. There was little wind, and the ones that were running were facing due south, the least invasive direction to our home. Noise study is over. Please, can you just shut down that one windmill from 12 am to 6 am? Sorry, cannot do it. Do you smell a bully here, Mr. Gerretsen? You people have created this mess. It’s time for our leaders to stop this ridiculous green charade, with these thugs traipsing through our townships and counties. How can you leave decisions like this up to small municipalities, who know nothing about wind farms and noise levels? Why not take some time, read the reports on health issues, talk to the people, find out what is going on in your province? You should be ashamed at the way your citizens are being treated. What do you have to say to the people that have been pushed out of their homes? I am all for green energy, my friend, but not at the expense of the well-being of people. What can be so difficult about finding and purchasing vacant land, making sure it’s clear of homeowners and erecting these turbines where they aren’t going to bother people, pets and livestock? Or at the very least, create realistic setbacks. What is going on is just insane. With all due respect, please get your collective heads out of the sand and start investigating. Talk to everyone, not just the ones writing the letters, or the farmers that are happy to have an additional income. Talk to the non-participant homeowners, who may not know where to turn to or how to approach the issue. How about talking to the farmers that feel they have been misled and are now without a voice, or the homeowners who find themselves in the middle of the farms with no input whatsoever? Chances are they are afraid to speak, lest they lose everything they have worked for. Yes, sir, that would be me: afraid to speak out because I can’t live here anymore and no one is going to buy a bungalow in a wind farm. What am I supposed to do? Our retirement home is ruined, thank you very much. While you’re at it, talk to the homeowners in the Ripley area. I hear things are pretty tough there. Don’t ask me their names; I don’t know them, because they are too afraid to speak out. Not all of us are able or feel free to speak up, sir. Some of your constituents don’t know which way to turn. 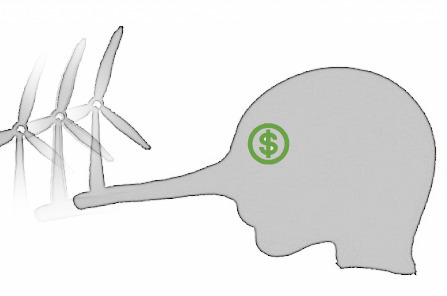 I thank you for your time and hope you can see past the whole goodness of green, and make the effort to investigate the other truths about wind energy. I am sure there must be other options to the placement of these farms. You have a wealth of knowledge in this province, and it is at your fingertips. You get the picture. In addition, turbine leaseholder contracts typically include a paragraph much like this, taken from a local, New York State contract. Confidentiality. Owner shall maintain in the strictest confidence (i) the terms of (including the amounts payable under) this Agreement, (ii) any information regarding Developer’s Operations and (iii) any other information that is proprietary or that Developer requests be held confidential, in each such case whether disclosed by Developer or discovered by Owner (“Confidential Information”). Developers call it a “confidentiality” clause. The rest of us call it a “gag” clause and interpret it to mean, Thou shalt not publicly say anything derogatory about the turbines on thine land. Added to the noise easement and gag clause, there’s of course the money. The money’s real handy and welcome. In the arithmetic of wind developers, noise easement + gag clause + money = silence from leaseholders. And, Good Neighbor Agreement + money = silence from non-leaseholders. That pretty well ensures the property holders won’t complain. Even if they’re inclined to, the fear of revealing the noise toxicity of their home to prospective buyers will keep most of them quiet. Except for thorns in the flesh like Barbara Ashbee. We are told that how we react to a given noise may be influenced by our attitude towards the noise source, our state of health and well-being, our personalities, education, income, previous exposure, ad nauseum. Does the transportation noise problem disappear if we all learn to love driving and flying, or the industries that make these activities possible? Would I have been less disturbed by the subway project if I appreciated what the TA [NY City Transit Authority] was doing for progress? Is a 90-decibel jackhammer really less of a noise because it takes place during the day, or because I’ve heard one before? It is relatively simple to measure the physical quality of the noise signal, its decibel level, frequency distribution, duration, number of occurrences per unit time, etc. It is virtually impossible to measure the significant human response to noise. Schemes for predicting complaints and evaluating annoyance responses are crude guidelines, their effectiveness questioned even by noise specialists. Anyhow, now you see why wind developers call their product Clean, Green, and Renewable. Take a look at the diagram below. Notice the well-known noise shadow pattern from an elevated noise source–such as a wind turbine. The following is from Barbara Ashbee’s journal. Official journal starts Sun Dec 7th. The week prior I had 3 nights in a row of no sleep, and was accompanied by stomach aches which passed after about a week and have not returned. I was extremely tired and not really functioning mentally properly due to lack of sleep. The continuing noise prompted my letter on December 9th to the wind company and copied to our Mayor and our Member of Parliament (MP). Sun.Dec 7th -west wind blowing windmills facing west. Blowing and drifting snow. Mon.Dec 8th – looking out kitchen window note there is a low wind, blades facing southwest. Fairly quiet. Resume getting ready for work start having a strong pulsation in my ears/head. Odd… so I decide to check the turbine and see the position has changed to facing directly south. Not sure if coincidence but certainly odd and all within minutes. Tues.Dec 9th –really crappy sleep again. Constant irritating, whirring sound. Wed.Dec 10th –awake at midnight. Light sleep. Awake again from 1:27 to 2:30 and suddenly everything went silent. Just beautiful. Turbines must have stopped. Took a bit to quit anticipating the noise resuming and fell asleep and woke at 8. Best sleep in a while and that is waking late for me. 7 is usual. Thur. Dec 11 – late at night, sounds like a bearing is squeaking in an easterly turbine. Fri. Dec 12th -had meeting with wind company in response to my letter. See secondary document. Sat. Dec 13th -early AM. Got 2 ½ hours sleep. Wrote email in morning asking to have them shut the rear turbine off from 12 to 6 am so we can at least get a decent sleep until they figure out what they are going to do. Sun.Dec 14th -Not as loud facing south -I got some sleep because I was exhausted. Dennis (my husband) was up 5 times during night. Turbines were still turning and they did not shut them off as requested. During day, extremely loud and very annoying. Turbine facing southwest, high winds, like living beside an airport but worse because sound doesn’t ever stop. Very irritating, can hear inside house like a dull roar. Bringing in groceries was even irritating. I am told my wind company representative does not have the authority or the capacity to make a decision to shut them down, but would bring it to the attention of the head office. Mon. Dec 15 -Dennis called township again re: driveway/road grading problem. He got stuck in 4wd because of the angle of the incline at the end of driveway and the ice build up. It is very dangerous as we have an obstructed view and have to stop at the end of our drive before turning onto the road. Was not like this before the wind farm went in. Tues. Dec 16 -Roads dept representative called Dennis to say he had been out there before but hadn’t phoned us to let us know. He says has nothing to do with windmills, that every 2 years the roads are topped with gravel and graded. We have been there for 3 full years and this is the first time it’s been raised and caused a problem. He acknowledges the driveway is low. They both agree nothing can be done now that winter has set in. Doug says maybe they will use cold patch to fix in spring. Wed. Dec 18 -I email wind company in the morning as we both had a terrible night trying to sleep again and report that the winds are moderate and blades are facing west, slightly south. Also let them know Dennis is very upset with lack of sleep. Independent firm arrives in AM to set up noise monitoring equipment. It is moderate wind and quite noisy. They set up equipment they are leaving and then take a noise level reading on equipment they are not leaving. App 6:50 same night, wind company agent calls. He says they cannot just shut turbines down because they have to continue to produce energy. He also says they can’t shut them down because there is a noise monitoring study going on, and I say I understand that and I wouldn’t expect them to shut them down while a study is going on. He says he has spoken with head office earlier and they would be willing to put us up in the hotel in Orangeville for a few nights so we can get a good sleep. I thank him and tell him we had thought about doing that very thing, but we have our pets to look after and are not willing to leave them. He suggests someone come in to stay with them and asks what it is we do if we go away, and I say my stepson looks after them but not on this kind of short notice. It’s usually well planned in advance. He asks again how many kids we have and about them. I say they are all adults and living on their own. He mentions it being Christmas time and I say yes they will probably be over to visit. I ask him to explain how these turbines work exactly and if there are any motors in them. He explains the wind sensors mounted on the top that automatically steer the turbine as the wind shifts. The blades also adapt to take the slightest wind and they can move on the turbine head to get best results from even light wind. He says there is a motor on the head only to turn the direction of the blades. And there is a brake to stop them from turning too fast in high winds. Fri. Dec 19th – Very bad storm. East wind. Turbines both east and west very loud. Like a jet going overhead, constant. Both at home so have TV etc. on but very loud outside. Sun Dec 21st– (see email to wind company dated Sun Dec 21st.) We retired at 9pm and watched TV until 11pm. Noise was worst it has ever been. Turbines were facing east when we went to bed but not sure if they had changed or not. Dennis got out of bed to see if the dishwasher had malfunctioned and was still running, it was so loud. Loud and had a gyrating rhythm. It sounded like our house was dumped in the bottom of a working washing machine. Not sure if it was one WTG (wind turbine) causing problem or the group of them. Dennis told me this AM he has been having ringing in his ears for about a week at night when he is laying down and trying to get to sleep. He hadn’t mentioned it because he thought he was getting a cold or something. I believe it is related. Our one dog is up and down at night pacing, and whining or barking at nothing. This has been going on since the windmills started up. Mon. Dec 22nd…..did not record for some reason. Tues, Dec 23rd – Awake from 11:30 to 3am and finally got up to go sleep on the living room sofa. I turned the TV on low to cut out the noise. We are so tired and irritable. I emailed wind company to update them and ask him to shut down the rear turbine from 12am to 6am. Our wind representative is on holidays and by means of an ‘out of office’ reply would not receive my email. I am a little annoyed I was not given a secondary contact considering all we are going through and the fact it is Christmas. I forwarded email to Mayor, MP, MPP and I called the wind company local office where I was told to forward email to a different person. I have not received an answer back at this time. The noise people were back today and did outside and inside tests. They mentioned there is a definite growl in our bedroom. I also noticed the day they come to do these noise tests, half of the turbines are not running and the two of most concern to us are facing direct south, which is a far less common position. I just wonder how good these readings will be as far as intensity. I asked them when they call the wind company to report, to please ask them to shut it down for Christmas. They say it doesn’t matter what they say, that they wouldn’t have any influence on them anyway. Wed. Dec 24th – Dennis received a call from wind company rep while I was out, saying he received our email but hadn’t called us. He says it is not in his capacity to shut down, but the minute we want to go to hotel, all we have to do is give him short notice. Dennis spoke to him about numerous concerns. Today the rep from the noise company took more readings, inside and out. A number of windmills are still down, but the 2 closest to us are running. Thurs. Dec 25th – Had a quiet night and a really good sleep. I actually reached a dream state again. It’s been a long time since that has happened. Fri. Dec 26th – Turbine directly behind and the ones to the north and south of it, are shut down. Another restful sleep and quiet. It is a pleasure to sleep again…..The working ones are facing southeast and we cannot hear them inside the house. Very low wind. Sat. Dec 27th – Well….as expected. At 7:20 this morning, I looked at my husband and said, “Well…they’re back up and running”. There is no doubt when they are down and when they are running, and to be able to tell that from bed, in the winter, with the windows closed just pretty much proves the point, no? My husband is experiencing ear ringing and we are both nauseous this morning, but maybe it was something we ate. My head too feels stuffed full of flannel and thick. It is very foggy out and unseasonably warm +7C. I cannot tell which way the blades are facing because of the fog. Sun. Dec 28th – The worst windstorm I can ever remember. Everything has melted and is causing terrible flooding. The three closest windmills behind us are shut down and the rest of the farm is running. Mon. Dec 29th – Wind has finally slowed down. None of the windmills are running in Amaranth, but Melancthon ones are running. Sleeping has been pretty good lately. Tues. Dec 30th – All of the windmills were turning slowly, but there was absolutely no sound from them. It was totally uncharacteristic of them. Blades were facing west. Really strange. Wed. Dec 31st – The windmills directly behind us have been down more than they have been running. I notice the 3 behind us are most often down. I am wondering if they actually responded to my wish for them to shut down overnight, but my husband thinks not. It is apparent that this whole wind farm has been running and not running for the last 2 weeks, and the ones down vary. Maybe I am just noticing it more because I am home more over the holiday. Thur. Jan 1st – Not much new. Some are running, some are not. Didn’t pay as much attention these last few days. The one behind is just mostly shut down lately. Fri. Jan 2nd – last night, went to bed to read, sounded like jet was going overhead. My husband said this time for sure it’s a jet, but it didn’t pass. I got up to open the window. It wasn’t a jet. It almost seemed to be coming from the southwest. It must be just the way it’s hitting our house or something. He has some sort of infection in his left chest. It is very angry looking, red and swollen. Sat. Jan 3rd – I have been having the odd ear ringing. Had not really affected me before and these 3 turbines behind me are still not turning. I went out yesterday to take some photos. Very clear and crisp beautiful day. Could hear all of the turbines running, I am sure including Melancthon, sounding like a big humming factory. I wonder how the wildlife gets along with this. How horrible it must be to have a terrible vibration in their habitat. I notice we have heard coyotes only once this year. That is very odd. They used to be pretty regular visitors around here. Dennis’ antibiotics seem to be working, thank goodness. What a strange thing for him to get. Sun. Jan 4th – They are loud today, easily heard inside on both sides of the house. They are facing southeast today with a moderate wind. The 3 behind us are still down but the rest are running. The sound is a hollow, gyrating vibration that sets deep into the ears. Wed. Jan 7th – In the middle of the night, wide awake and frustrated, I emailed wind company to see if the noise study results were back yet. Reply was no, but they thanked us for the patience. Thur. Jan 8th – My hubby asked me to email wind company again. He is not that computer savvy, and so I do the emailing etc. It was terribly loud again last night, and I also realize the noise study people never did get back for a late night attended reading. I am so frustrated because that is the absolute worst time to try to rest and it is so loud. I will see what the report says. I emailed wind company again to request the rear turbine be shut down at night. I have been somewhat remiss in keeping up my diary as I am working through a significant change at work and have a very busy schedule of late. Tues. Jan. 13th – Have been very busy. Attended East Gary meeting tonight. Went well and talked to both residents and council members. Thur. Jan 15th – Not noisy at all. 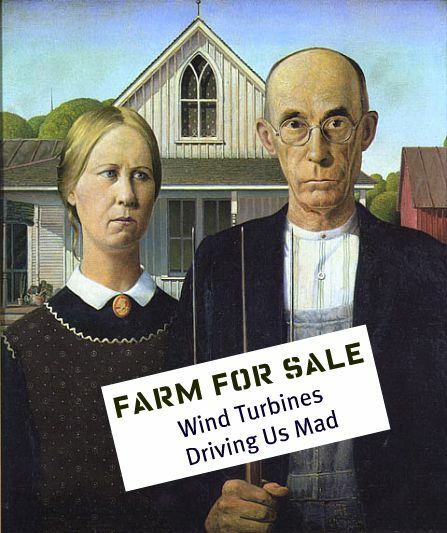 Turbines shut down…no wind. Slept pretty good through the night. Meeting with wind company reps. See separate document. -15C verrry cold. Fri. Jan 16th – Went to bed at 7:30 last night. Was feeling nauseous and very tired. Fell asleep instantly and woke early in AM. Feeling better and rested. Moderately noisy like an overhead jet this morning around 5-6 am. We tried to catch it on the camcorder but were not successful and it is -16C so did not try too hard. Too cold. 2nd noise study is set up again this afternoon with monitors outside and inside the bedroom. Many windmills down again today. Sat. Jan 16th – Recorded bedroom at about 9 PM as it is quite loud. Ranging from 29 up to 36 dBA, mostly in the 29-31 dBA area as we were watching it. Sun. Jan 17th – Loud last night. Winds from the southeast and lots of snow fell. I decided to run the recorder at 2:23. The measurements were jumping up to 36 again. Sound like a jet overhead with high and low pitches. Things went pretty quiet at about 3 am while the recorder was still operating. This morning the mills are facing due south. They are pretty quiet today. Next time you drive through a so-called wind farm (these industrial installations are neither “farms” nor “parks”—another cute name developers use), play Bob Lucas’s Green Energy Blue on your iPod and ask yourself how many Barbara Ashbees are going mad there.